We make some of the most nimble and compact pdc drill bits in the industry. In addition to our complement of surface and drill-out bits, we manufacture and supply the most preferred curve, build and lateral pdc drill bits of experienced directional drillers across the continent. Cryo EdgeTM cutters use an advanced manufacturing process to produce a durable and abrasion resistant pdc drill bit cutter with excellent thermal stability. Heli PathTM geometry allows unparalleled directional responsiveness, improving control and providing excellent build rates. Rhino ArmorTM complements the pdc drill bit profile, providing maximum protection to critical surfaces. Shadow PathTM Work Sharing System mitigates heat build-up by adding diamond volume to the pdc drill bit shoulder, increasing cutter longevity. Drilformance PDC drill bits are engineered to engage a wide range of drilling formations and applications while delivering smooth, consistent torque. Drilformance PDC Drill Bits are the ideal choice for directional drilling, providing the ultimate in steerability thanks to a compact unibody profile coupled with proprietary PDC cutter technology. 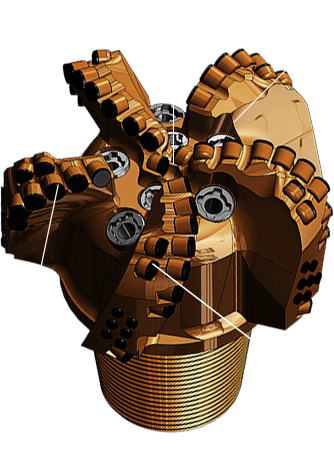 Our PDC Drill Bit cutting structures are complemented by Accelglide, allowing our customers to increase efficiency downhole. Designed for directional control and durability. Available in 4,5 and 6 Blade Models. Designed for speed and directional control. Available in 4,5,6,7 and 8 Blade Models. Designed for exceptional durability and speed. Available in 5 and 6 Blade Models. Available in 5 Blade Models. © 2018 Drilformance Technologies. All rights reserved.